Is there a way to design a LaTeX template that would either enforce given sections, subsections, etc or generate an error if a given section label were missing upon compilation? Assume that other sections are allowed without restrictions, and that required sections need to appear in the given sequence. How could I enforce this programmatically within the template? You can redefine the \section command to set various flags so that we can do the appropriate checks. 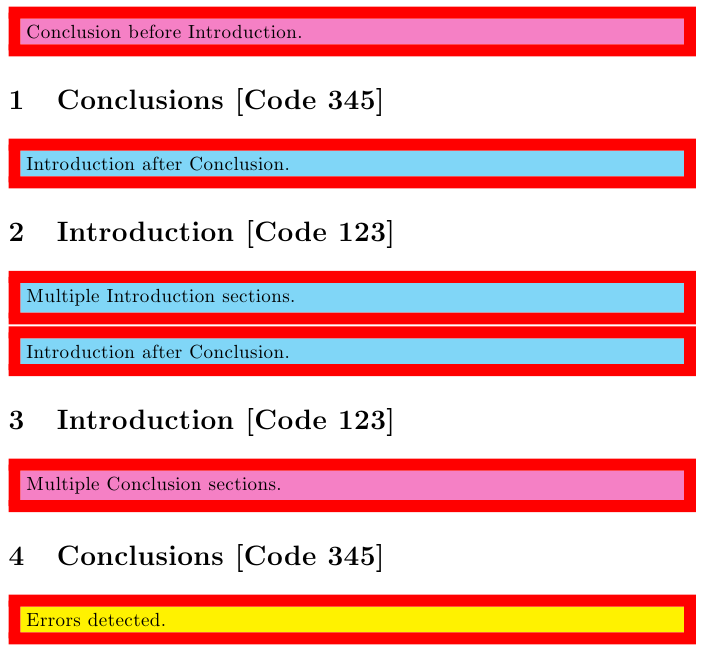 Note that messages specific to the Introduction section are in cyan, and those related to the Conclusion are in magenta. Since no test case was provided only minimal testing has been done. Needs further testing to ensure that all cases have been covered. I have used \newtoggle from the etoolbox package as I prefer that syntax versus the \newif syntax. But if you don't want to include an additional package it should be pretty straightforward to adapt this to use \newif or some other conditional methods. The xstring package for string comparison. As you can see I am not very good at selecting goes with colors. However, in this case, that turns out to be a good thing as you don't really want to be seeing those messages in your document. You could also use \PackageError (see commented code) to quit out with a console message if so desired. Question Paper Template in LaTeX?